Our site has the internet’s most extensive gallery of vintage porcelain signs, and other advertising collectibles. We are here to help you in your collecting endeavors so feel free to Contact Us, Join Our Mailing List, or just Browse the site! If you have a porcelain sign that you’d like to sell then you’ve come to the right place! 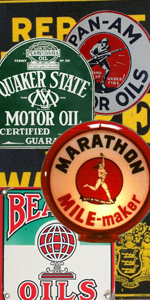 We offer to buy most vintage or antique signs and other porcelain enamel advertising items. If you found your sign in one of our image galleries then there’s a good chance we would be interested in purchasing it. We make aggressive offers for rare or high-grade items and we buy hundreds of signs every year, usually beating out offers from other dealers. For the fastest help you can text pictures of your sign to 404-606-2648 or email to Dale@PorcelainSigns.com, once we’ve gotten some pictures we will respond and help however we can. 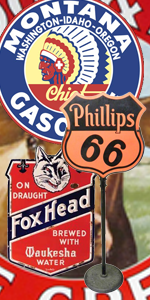 We are porcelain sign collectors; and we can pay collector prices. As a service to collectors, experts, and novices alike, we offer free appraisals for signs and porcelain items. Whether you’ve just inherited something and need to know what it’s worth, you found something you’re interested in and don’t know what to pay, or you are just curious for information about your item, feel free to contact us with pictures and we can help you by providing an estimated value based on rarity, condition, and current market trends. In order for us to provide any kind of accurate appraisal, we need you to send us pictures of your item. Telling us that it’s just like the one pictured on the site or in mint condition isn’t good enough and just causes confusion on both sides. For this reason we can’t provide any pricing information until you can provide us with a picture of the actual item you have.